Members of Alberta's Fire Aid Organizing Committee, comprised of volunteers from across the province of Alberta, proudly announced today the details for Fire Aid for Fort McMurray - a major benefit concert being planned in support of people in the City of Fort McMurray and the Regional Municipality of Wood Buffalo (RMWB) directly impacted by the Alberta Fires. 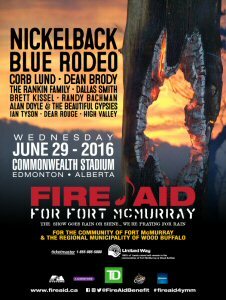 Fire Aid for Fort McMurray is set to hit Commonwealth Stadium on Wednesday, June 29, 2016 at 4PM MT. All proceeds raised from this event will benefit the Fort McMurray United Way to support the city's efforts to rebuild for all residents, individuals, families and businesses. Canadians have expressed immense compassion and generosity during this time and many award-winning Canadian musicians have been keen to contribute to these efforts. World-class Canadian talent, including many hailing from Alberta, are ready to take the stage at Commonwealth Stadium on Wednesday, June 29, 2016 including, Nickelback, Blue Rodeo, Corb Lund, Dean Brody, The Rankin Family, Dallas Smith, Brett Kissel, Randy Bachman with The Sadies, Ian Tyson, Alan Doyle and the Beautiful Gypsies, Dear Rouge, and High Valley. Tickets for Fire Aid for Fort McMurray, a major benefit concert in the name of community, are on sale Monday, May 30, 2016 at 10AM MT. Tickets are $35.00, $60.00 and $99.00 and will be available at ticketmaster.ca or charge by phone at 1-855-985-5000. This past May, Albertans, Canadians and the entire world were shocked by the devastation of the wildfires in Fort McMurray and across the Regional Municipality of Wood Buffalo. Those affected were friends, neighbours, family and colleagues, and our hearts have continually gone out to them in their time of need. In the spirit of community, a dedicated group of volunteers from across the province, including the core team of organizers of the 2013 Alberta Flood Aid benefit concert, have come together to create Alberta's Fire Aid Committee, working to help rebuild and sustain the future of Fort McMurray and surrounding regions. Co-chairing Fire Aid for Fort McMurray are Edmonton-based community leaders Bob Nicholson, Oilers Entertainment Group (OEG) CEO and Vice Chair, Len Rhodes, Edmonton Eskimos Football Club President and CEO and Tim Reid, Northlands President and CEO, alongside special Honorary Chair, her Worship Mayor of the Regional Municipality of Wood Buffalo, Melissa Blake. All funds raised will go directly to the community as the Fort McMurray United Way has been selected as the beneficiary from Fire Aid. United Way's mission is "to improve lives and build community by engaging individuals and mobilizing collective action," making this cause the perfect fit for Fire Aid for Fort McMurray's beneficiary. The United Way will work with the various agencies on the ground in the region and help the thousands of residents with the support they need now and for however long it will take to rebuild. TD Bank Group has joined the Fire Aid effort knowing that the recovery and rebuilding efforts will be massive, and through their early efforts and contribution of $500,000 to Fire Aid, they show their commitment to rebuilding this community. The TD First Responders sponsorship highlights the heroic efforts of those who have given so much and in addition to supporting relief efforts, are honoured to host first responders during the concert. To view the photo associated with this press release, please visit the following link: http://www.marketwire.com/library/20160526-LVN_FireAid.jpg.